The top freshman so far this year is Ashlyn Keeney of Liberty High School. She has run the fastest time in the state with an impressive time of 18:12.40. That performance helped her win the Iowa City West Early Bird Invitational, leading the Lightning girls to a 3rd place finish overall for their first meet of the 2018 season. This is particularly noteworthy as the school is only in it's second year of existence... talk about a strong start to a program! Kaia Downs is the only other freshman to break the 19:00 minute barrier in this early season, running 18:57.17 at the Bishop Heelan Invitational. She led Sioux City East High School to a 2nd place finish. Sioux City East High School had 2 other freshmen in their top 5, a sign that they could be on the rise of something great. Johnston High School has continued their incredible run of great underclassman coming in with two of the top four freshman times thus far. With Faith Nead running a 19:49 and Aleah Tenpas running a 19:55, these two-freshman set the team up for a shot of winning their 3rd state title in a row. Taylor Kvale won the Charles City Early-Bird Invitational with a time of 20:00.00, leading Dike-New Hartford to a second place finish behind Denver high school with a strong finish from the freshman. 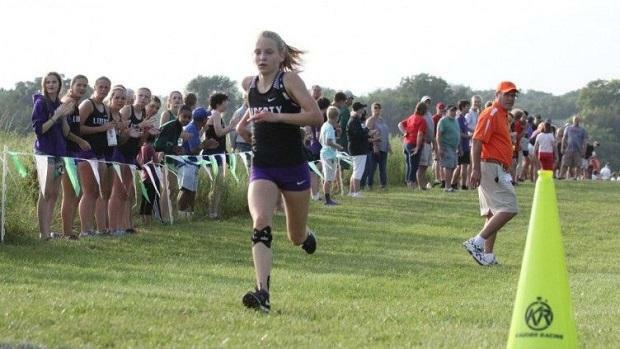 There are surely some stud freshmen this year that could nab many of those All-State spots in October... another noticeable freshmen to keep an eye on is Ainsley Erzen who is expected to run tonight at the Dallas-Center Grimes meet tonight.